The artist may set up a still life without due thought to the lighting. Shadows being non-solid may be overlooked, and may appear to fall off one side of the canvas when painted. This may compel the artist to fade them out as though diffused by strip lighting. The artist may further forget that pale objects may appear dark if lit from behind, portraying instead the object’s local colour. Such treatment may result in a painting that lacks atmosphere. How can the artist make best use of the light in painting? Light is a vital factor in a composition, for light and shadow appear as solid to the eye as the objects themselves. Forgetting that shadows contain shifting hues and tones may result in black shapes that resemble holes in the painting. Subtle effects such as varying outlines and reflected light may also be overlooked, robbing the painting of all mood. But the following might help raise awareness of using light for painting. Examine the two paintings. It will not be immediately apparent that they comprise of identical compositions. The difference is simply the direction of the light. Light, especially sunlight, has a fundamental effect upon how objects appear, which is why it is such an important factor to consider in painting. Both paintings were completed alfresco on two identical consecutive afternoons. The painting above was completed facing north; the painting below was completed looking west. Notice how different the colours are for both. The pudding basin is white, yet in both paintings, different colour palettes were used. The apple is bright red in one picture, yet it is almost black in the other. The actual colour of the objects is known as the “local colour” and will not always agree with the eye actually sees. When it comes to painting, it is best to ignore the local colour but to record the perceived colour: If the apple is red but appears to be violet, paint violet rather than red. The same object may often require a different palette when lit in different ways. Objects lit from behind will often feature tonal contrasts and subdued hues; a setting lit from the front will feature more definite hues and less shadows. In the case of the paintings, one required, ultramarine, burnt umber and liberal amounts of white; the other, burnt sienna, viridian, permanent rose and moderate amounts of white. 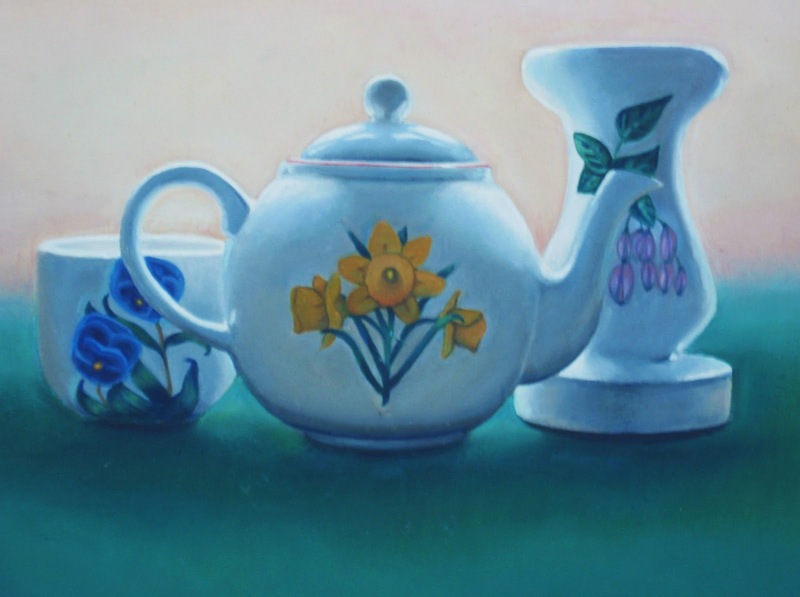 Shift the objects around under a light source and see how the shadows change in colour, tone and intensity. The hues of the objects will appear to shift too. Look for definite hues in white objects and bright colours in black objects. Natural light, particularly sunlight will emphasise these effects. Shifting shadows create challenges for the artist wishing to capture their essence, but being transient, time is a factor. I often record the shape of the shadows quickly and then block them in. Making snap judgments in colour mixing is often required. Once the shadows have shifted, don’t be tempted to alter them accordingly, for this could mess up the painting. Ignore them and continue with the other subject matter. Painting light is more about capturing many moments in time, as opposed to photographing one moment. Poor lighting may make the brightest still life objects appear dull. The artist may find colour mixing more difficult, which will have a knock-on effect on the painting. Artificial lighting serves only to make the still life setting appear lurid, creating fuzzy shadows with no contrasts. But outdoors, even on a cloudy day, the contrast can be breathtaking. 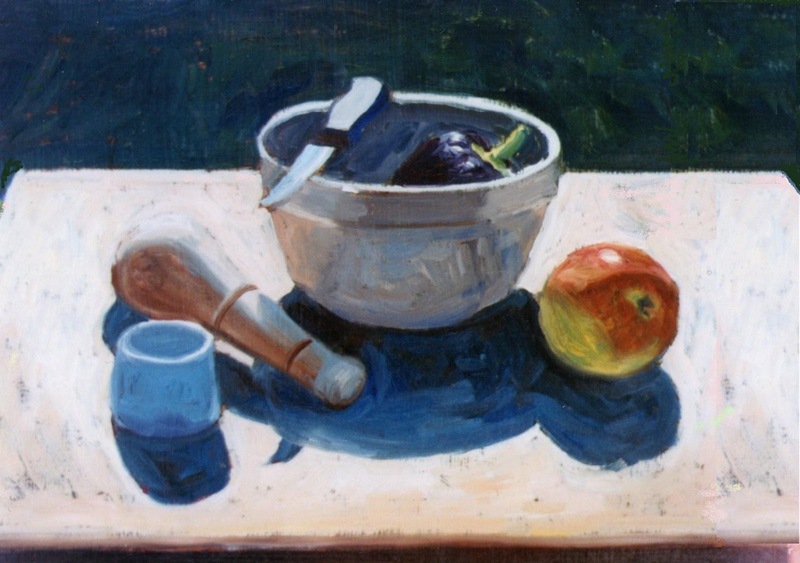 How does the artist prepare for still life painting en plein air? 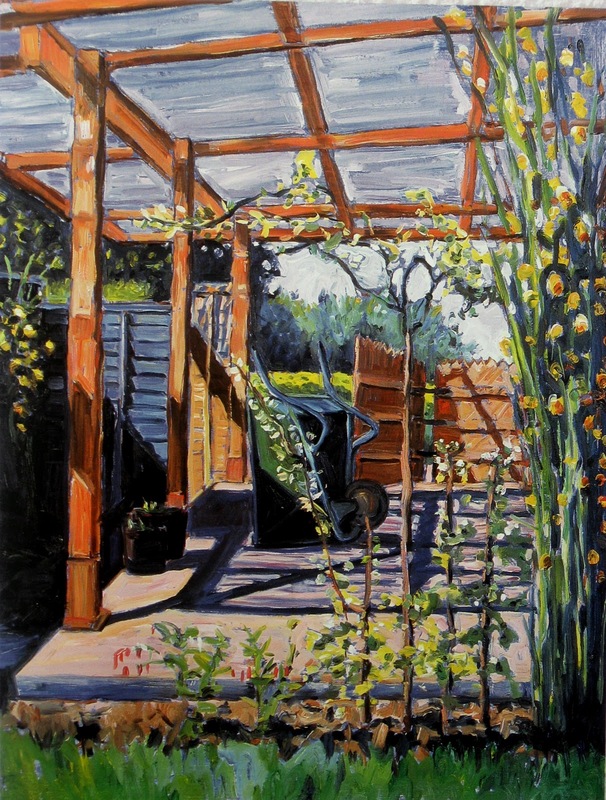 The artist does not have to go traipsing off into the landscape to paint alfresco; one’s own back yard is ideal. The light that floods the garden is often far brighter than the light that filters indoors, even on a cloudy day. Objects appear more vibrant and contrasts between colour and tone more intense. 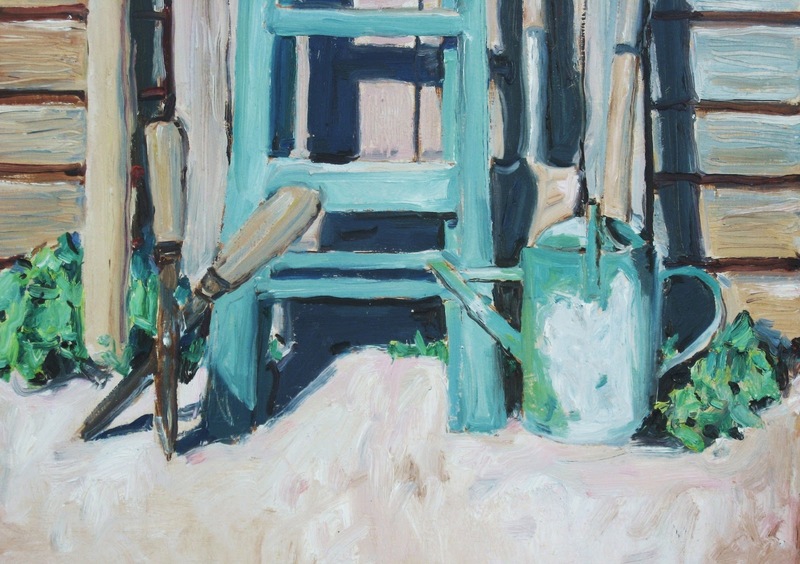 As a bonus, new possibilities for still life subject matter seem to open out: tomato plants, wheelbarrows, deckchairs, trellises, gardening tools, swings, hanging baskets, urns, water-features, bird tables, garden ornaments, fish ponds, bird boxes – and natural light. However, the simplest everyday objects can be used and when carefully arranged in the garden, exude a beauty rarely seen indoors. Setting up a still life outdoors need not be difficult. A patio table and chair can be used as the painting station. I often use as tripod stool as used by campers or fishers, as it allows unlimited elbow room. Adjust the seating so the thighs are parallel to the floor. This will also make the paints easier to reach if placed on the ground. An informal setting with minimal clutter is best. An easel need only be used if working large. Otherwise, affix the painting to a backing board via bulldog clips and prop against a patio table or similar. Place all art materials on an old sheet so that it can be gathered up quickly if the weather changes. Weigh down with stones if it turns breezy. Beware of hotspots in the garden and also of bright sunlight bouncing off the painting surface. If possible sit in the shade or under a parasol. Wear a hat and sunblock. A cool drink always comes in handy. There is nothing wrong with wearing sunglasses, for they cut out the glare and make the still life stand out. But take them off from time to time to check the colour mixes. Plan ahead for such a fickle thing as sunlight. Conceive and sketch the composition on a dull day. This will negate pressures to get the paint down before the light fades. Finding an interesting still life composition in the garden will involve viewing, walking around, taking notes and sketching. Swapping and changing the objects might sometimes be necessary. Take the time to get the drawing right. Make a note of where the drawing took place and how the objects were arranged. Taking due thought over this will ensure a successful painting on the day. If the weather forecast is good, prepare the art materials in readiness. Consider where and when the shadows creep in on certain times of the day. It would be pointless to begin a sunlit painting in late afternoon if the sun sets behind the house. Allow more time to complete the painting than one thinks. I find early morning or teatime in spring or late summer allows the artist ample time to record the shifting shadows. Diffused sunlight as seen beneath a parasol will take away the element of transience if the artist wishes. 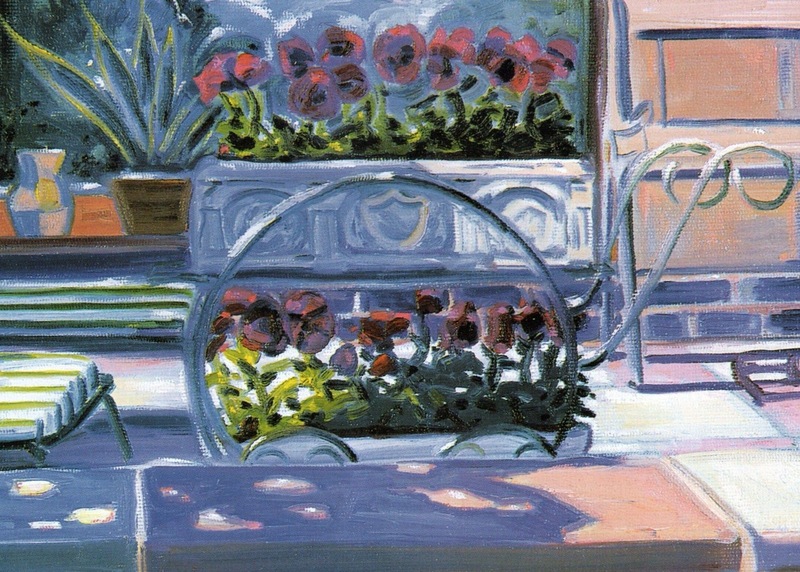 But if the painting does not turn out at first another can be tried without too much preparation, but painting alfresco in the garden is arguably one of the most unique ways of producing still life art that may prove addictive. 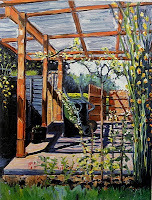 More about producing still life art in the garden can be found in my book Oil Paintings from your Garden, as signed copy of which can be purchased from Ebay (see visual link on the top right of this blog) or from Amazon. What is the Best Technique for Painting Detail in Oils? Embarking upon a painting featuring lots of elements regarding textures, patterns and colour shifts may overwhelm the artist wishing to try something challenging. Striations on seashells, embroidery on curtains or layers within red cabbage may cause visual overload where the artist does not know where to begin. What is the simplest technique for painting detail without compromising the quality of the finished artwork? The idea of embarking upon a painting with lots of detail is often appealing. The reward of completing an exacting work of art that catches the eye and entices the viewer to take a closer look may cause the artist to go in with both feet with such a project. However, once faced with the reality of emulating a multitude of patterns and textures, the artist may experience the wind go out of the creative sails. The following may cause an unsatisfactory painting with detail. Trying to complete the painting in one go and with increased haste towards the end due to fatigue. This will be reflected in wobbly lines, patchy colour mixes and uneven paint layers. Spending too much energy on preparing the project, collating visual resources, completing an accurate and detailed drawing, and setting up the workstation. When the time actually comes to paint, the artist may become lacklustre and run out of steam. An uncompleted painting is the likely result. Using inferior art materials for exacting processes, such as cheap brushes and pigments with poor tinting strength will create difficulties for the artist and an unsatisfactory painting of detail. The artist must think realistically about how the project is to be completed. The following tips may help. Accept that a large detailed painting will never be completed in one day. Plan what to do first and how much per session. Be realistic about how much time the painting will take. This will keep the painting manageable. Create small goals. 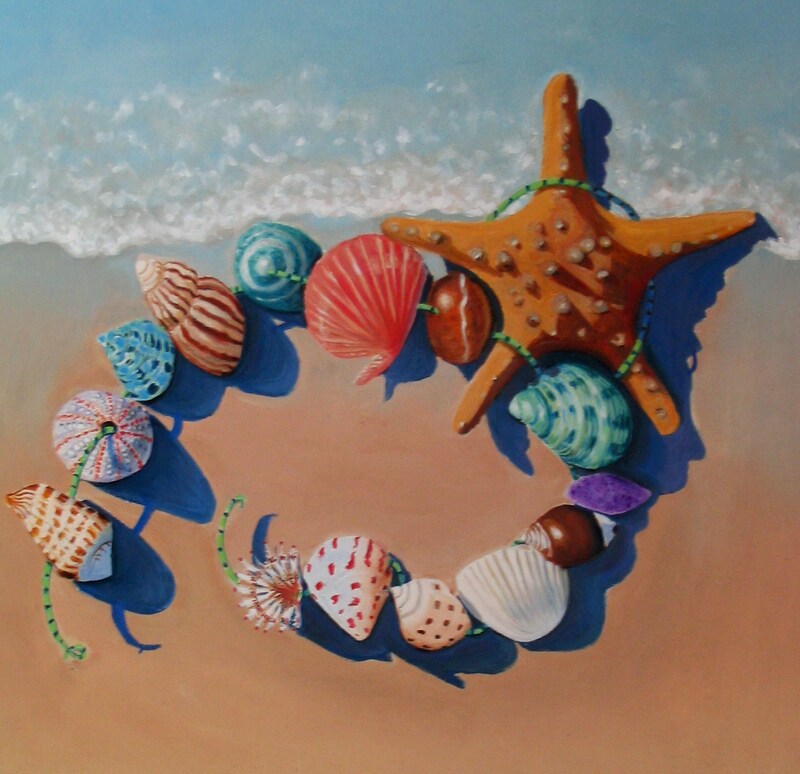 If the painting features several objects, complete one object per day. Alternatively, if two or three objects contain similar hues, such as maroon striations in a red cabbage and textures on a beetroot skin, complete those objects containing that particular hue together. Begin the painting session with the most challenging detail when feeling most up to it. The easier parts can be completed at the end of the session. Take regular breaks from the painting. Time easily slips away whilst engrossed in painting each layer of an onion. Don’t push too hard. Beware of discomfort when sitting too long. Move about periodically. Try not to think about the whole painting whilst painting a small aspect of it. Relegate all other objects as invisible. Imagine the painting is in fact several paintings in one. This will make the artist feel that the painting is moving forward. The artist must never guesswork detail, or the painting may fail to convince. For this reason, excellent visual resources and good lighting are vital. This means photographs of a high resolution or subject matter that is up to standard. Good lighting conditions may comprise a north-facing skylight, or adjacent window. Painting in dull lighting may give the artist a false impression of the painting’s quality until viewed under bright conditions. Excellent quality fine sable brushes are vital. Kolinsky sables provide fine points, softness and springiness. When it comes to sharp detail, rounds sizes 0, 1, 3 and 6 will suit most purposes. A selection of filberts or fans will create smooth blends. Apply an imprimatura of an earth colour, usually thinned burnt sienna or burnt umber acrylic paint. This will kill the overpowering white layer of the canvas. Sketch the composition on top with a fine chalk pencil. Detail is not essential as the drawing will be concealed by the overlying paint. Select an object in the painting; in this example, an onion. Apply the base colour thinly, which might be cream or beige Express shifts in tone and brush away unwanted marks. Apply the detail with slightly thicker paint. The onion layers can be suggested by applying thinned paint via a rigger or thin sable. Even out unwanted brush marks, accepting the object will not be perfect at this stage. Allow to dry. In the meantime, the artist may embark upon another object if feeling up to it. Return to the onion another day once touch-dry, applying a second glaze. This glaze can be used to modify or improve upon the lower layer. Sharpen up detail and smooth out unwanted brush marks. The artist may notice the object appears sharper, more intense and closer to the desired effect. A third layer can be applied if desired, although only select areas may need attention. How do I Paint Rust and Rusty Objects in my Still Life? With the aim of supplying contrast between the old and new, the artist may include corroded objects in a still life. Rusty tools, watering cans or engine parts are sure to challenge the artist wishing to explore different textures. But despite attaining the desired colour mix, the objects portrayed do not suggest oxidisation. What art technique can the artist use to portray rusty metal convincingly? Aged textures on metal may sometimes defeat the artist who is unsure of how to capture the texture of rust or peeling paint. Sensitive colour mixing is not always enough to suggest rust, and in some cases will merely make the object appear brown or orange. This situation is not helped if the paint is applied evenly and with uniform brush marks. The secret to painting rusty objects effectively lies partially in colour-mixing; the rest is down to how the paint is applied. Partially-oxidised metal objects will offer interesting contrasts between blemished and unblemished areas, which can be exploited in paint. Peeling paint can also add charm and visual textures to any still life. With several elements to consider, there is a choice of techniques the artist may use to suggest each. Good visual resources are vital for subtle effects such as rust. In this respect, little can compare to painting from life, which was what I did for the rustic watering can. The following technique can be tried. Make sensitive observations of the rusty object regarding hue and tone. I find various amounts of burnt sienna, cadmium red, burnt umber, permanent rose and white occur most prevalently in rusted objects, although blues and violets will be seen in shaded areas. Corrugated iron may exhibit burnt umber, ultramarine and pthalo blue in various portions. Apply a thin under-glaze of burnt umber acrylic prior to the painting. This will help when judging tonal values of the rust, as well as support the overlying rusty colours. Once dry, begin with the palest areas of the rust first. Apply the paint briskly and unevenly via a filbert ox-hair. Allow a little of the under-glaze to show through in places to add expression and suggest rough textures. A technique known as sgraffito can be incorporated, which involves etching into the paint layer with sharp implements to emulate a scratchy surface. Work progressively darker, adding a little ultramarine and/or burnt umber. Allow brush marks to remain in the paint. If peeling paint is featured on the object, apply the colour concerned thinly, working the paint roughly. If the painting of rusty metal does not work out, allow the painting to dry and then work on top. Uneven layers of the underlying impasto will enable the artist to “scumble” paint onto selected areas of the subject matter to achieve a broken glaze. Applying the oil paint thinly (without adding linseed oil) will bring an effect like pastel pencil to the painting, ideal for suggesting rusty textures within a still life setting. The raised edges of cracked paint on a metallic object can be suggested if a little burnt umber is applied to shaded areas of the painting via a fine sable. Better control of the paint is possible if the pigment is applied neat rather than thinned with linseed, bringing an effect like crayon. Do not apply the paint in linear fashion, but with uneven marks. Remember that shadows cast by raised edges will often adjunct bright highlights of the raised edges themselves. Finally, remember to make artistic comparisons between the rusty areas of the object and the unblemished metal, to ensure the tone and hue of each relate accurately. In a bid to recreate the luscious greens of foliage, the artist may reach for any blue and green pigment and blend them together, but murky brown materialises. Hopes for a vibrant purple, as seen on grapes could be quashed when a blend of blue and red yields a dingy grey. In other cases, the colour is too garish, too dark or too wishy-washy or just doesn’t hit the mark. How can the artist mix any colour required for subject matter in painting? If asked what the primary colours are, the automatic reply might be red, yellow and blue. However many artist pigments containing these labels contain other pigments. Lemon yellow, for instance, has a greenish cast. Cadmium red contains a lot of yellow. Ultramarine blue contains a lot of violet. Since Ultramarine is biased towards red, it would not be a fitting blue counterpart if a piercing green mixture was the objective. The true definition of a primary colour is one that cannot be made by the mixture of two other colours. 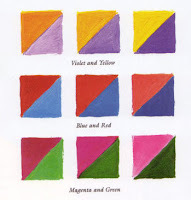 By this definition, magenta, yellow and cyan, as found in printing ink, is the most fitting answer, although no pigment can truly match the purity of filtered white light. Despite this, pigments closely approximating this purity exist on the market and which will produce clean secondary colours. Paint manufacturers use varying labels to denote these primary colours. Some may refer to them as “process” or “Winsor” colours. Gleaning colour charts and making comparisons with the primaries of printing ink is how I chose my primary pigments. Cadmium yellow (pale) is a vivid yellow and is pretty close to the primary yellow of printing ink. Pthalo blue, like cyan, is a sharp blue, although is deeper in tone. Red is not in fact a primary colour, but a secondary colour for it can be achieved by mixing magenta with yellow. Magenta for this reason is a primary colour of an intense rose hue. In terms of oil pigment, resembles permanent rose, which will produce clean violets and indigoes. And the tonal value of the colour. My Youtube clip explaining why red is not a primary colour offering solutions in colour mixing. As well as the hue, observe the colour temperature of the object, as red can be warm or cool, as can blue. The warm blues found on a summer sky can be achieved by using ultramarine and white, or introducing a little cadmium red or burnt sienna into the blue mix. Cool blues, as seen in lake reflections can be achieved by introducing pthalo blue and a little burnt umber into the mix. Of course, few objects are simply “red” or “purple”, but degrees of a hue. This involves toning down the colour with earth colours and neutrals. The subdued blues of distant mountains can be achieved by toning down blue with burnt sienna. Dusty pinks as seen on pansies can be recreated by adding a little burnt sienna, ultramarine and white with the red mix. When it comes to neutral pigments, many are not required. Burnt sienna and burnt umber are the only earth colours I include in my palette, as too many can often result in dirty and lifeless colour mixes. Colours can get in the way of what is light and dark. This interference can cause tones to be overlooked. To filter through this chromatic interference, half-close the eyes. This will break the setting down into areas of light, dark and mid-tones. Rather than use black or dark grey to darken a colour, try mixing opposing colours, also known as the “complimentary colours.” The complimentary colour to a given colour can be found on the opposing segment on the colour wheel. The complimentary colour of magenta (not red), for instance is green; the complimentary colour of violet is yellow. Introducing a colour’s complimentary to a given colour will produce rich darks rather than dingy blacks. An evergreen houseplant that harbours lots of shadows can be darkened with any colour on the opposing segment to green. In terms of pigment, this can be permanent rose, cadmium red or burnt sienna, depending upon the intensity and the colour temperature of the darks. Similarly, the shaded areas of a banana can be achieved by adding violet or any colour containing violet, (perhaps ultramarine, or a blend of pthalo blue and permanent rose) to yellow. With the above in mind, the artist can recreate any colour with reasonable accuracy, but the real key is to observe the objects in front. Look for slight colour shifts in temperature, intensity and tone. Try out the colour mix on a scrap piece of card before applying it onto canvas. Lastly, look out for colour relationships. How does one colour of an object compare to another? Is it paler, softer, cooler, deeper? Keying in each area of colour with another in a still life will help the painting make sense. The paper-thin texture of flower petals or popular imagery or flowers in delicate watercolour washes may compel the artist to reflect this view when mixing colours for flowers in a still life. Candyfloss pinks and peaches make parts of the painting appear bleached out or faded like a photo left out in the sun. How can the artist paint vibrant flowers in a still life without the risk of the colours looking garish? Assigning flowers with simplified chromatic labels according to type, and then applying the colour concerned without further observation, such as: lilies are white, daffodils are yellow, poppies are red and roses are pink. Applying a pale colour mix such as pink or pale blue onto a white painting surface, creating the impression that the colour is dark. This may cause the artist to mix pale colours throughout, leading to an overly pale painting of flowers. Thinning the oil paint into thin washes in the style of watercolours in alla prima (in one layer), will often result in lifeless colours once the oil painting has dried. A fear of darkening bright colours for shadows may lead the artist to use pale greys or neutrals instead, which without the full complement of tonal values, will make the painting appear like an over-exposed photograph. Leaving highlighted areas blank or just white, giving the impression that the painting is incomplete. My Youtube clip on the painting process of a daffodil might be helpful. The demonstration took around half-an-hour or so to do, but the clip has been speeded up to a couple of minute viewing time. Flowers contain contradictions: lilies may contain dark blue; daffodils may possess violet; poppies often contain indigo and roses may harbor ochres. Stripping away labels regarding the colour of flowers will help the artist view flowers honestly. Rather than use grey, or even black, a bright colour is best darkened with its opposing colour. In the case of yellow flowers, this will be violet or any colour containing violet, such as ultramarine or permanent rose; green can be darkened with red or any colour containing red such as cadmium red or burnt sienna. Mixing opposing colours will result in rich, deep darks in flowers. I find ultramarine with a dab of burnt sienna provides the ideal darks for white flowers such as lilies. Substituting ultramarine for pthalo blue will suggest cooler darks. Rather than paint flowers onto a white canvas, apply thinned paint over the surface first. Acrylic paint will dry quicker than oils and provides a stable surface. Such an under-glaze is known as an imprimatura. Any colour can be used, although neutral colours are the norm, which might be an earth colour or grey. This enables the artist to more accurately judge the tonal value of a given pigment when applied on top. Pale blue will indeed appear pale rather than dark in context. Try other colours for the imprimatura. Using the opposing colour to the hue of the flower heads will inject energy, vibrancy and movement into the overlying paint if applied as a broken glaze. A red imprimatura will make blue flowers appear to shimmer, as would a violet under-glaze for a painting of daffodils. Try to use every tonal value in the flowers from very dark to almost white. Half closing the eyes will filter out the chromatic aspect of the flowers and help simplify the flowers into basic areas of light and dark. Reflect this simplified view when rendering the flowers at first. Delicate flowers can in fact contain rich tones and saturated colours. Glazing is one such techqnique to try. This is done by thinning the paint with linseed until it has the appearance of stained glass, rather like a watercolour wash. Subsequent glazes are applied on select areas of the painting once the previous glaze has dried to achieve deep rich colours and a high finish. Detail can be applied on top by dragging the paint via a fine sable for stamens or tight folds in petals. Thick paint can also suggest delicate colours made more intriguing by the use of robust brush marks as opposed to a delicate application. Peaks and troughs in the paint, when viewed under oblique lighting will often add punch to the most delicate colours and suggest form. The use of impasto medium, an alkyd-based agent that thickens the oil paint, and palette knives are ideal for suggesting rich textures in carnations or dandelions, for example. Stand back from the painting every now and again to ensure the colours of the flowers can be appreciated from afar. This will also enable the artist to view the flowers within the context of the still life. Do the flowers appear too bright; too dark? Are the colours too heavy? The surrounding areas can also be used to add form or provide the stage for flowers such as shadows and reflections. A blue shadow juxtaposing poppies will make the poppies appear more “red.” Bright light will also create reflected light; light bouncing back into the darkest part of flower heads from a neighbouring bright surface, creating pinks, golds or creams. How can I Make my Still Life More Interesting? 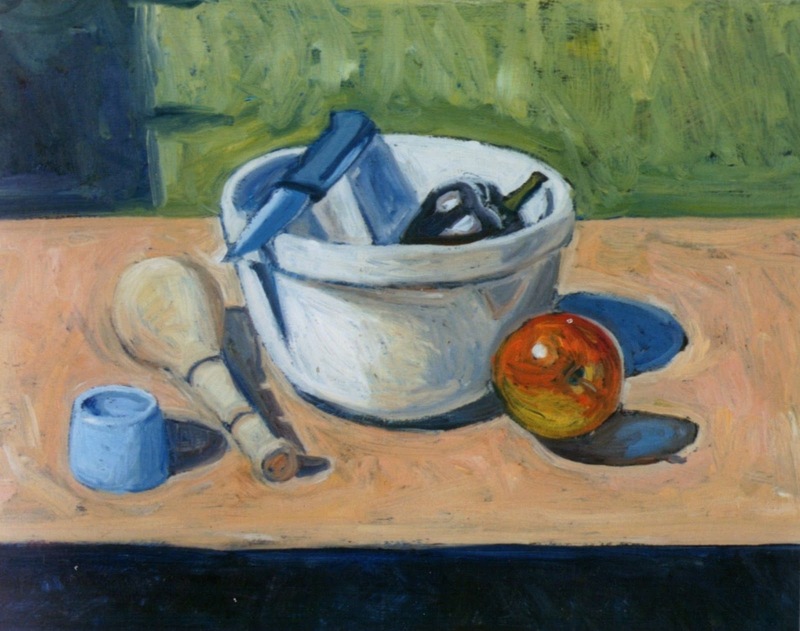 A stereotypical still life setting may result from the subconscious collation of images depicting fruit, a bowl, a bottle or a vase of flowers to be requisite subject matter for still life painting. The artist may place such objects in a row and standing to attention beneath artificial light. On reflection however, the artist may suspect that opportunities for making the still life stand out may have been overlooked. How can an interesting still life painting be created? Not trying other possible object combinations and merely opting for the first objects that present themselves. Going for the most orthodox viewpoint without shifting the angle from which the objects can be seen, such as a setting viewed flat-on. 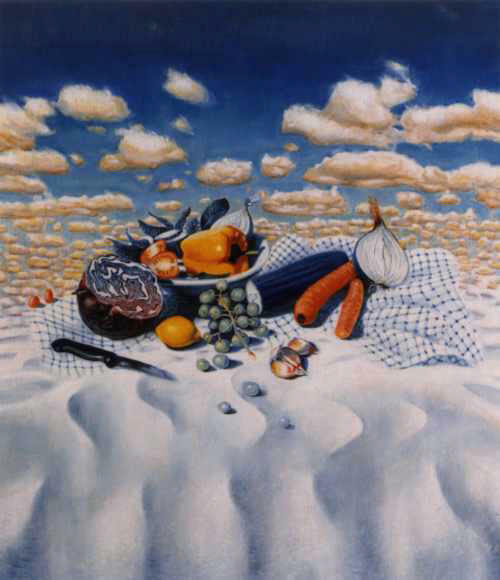 Low visual awareness, consigning various elements to invisibility such as the background, the lighting and the shape of shadows may result in a painting that reflects this view. Fear that the still life may look silly to othes if trying experimental techniques. Try viewing the objects from bizarre angles rather than just eye-level. View them from directly above or from a vantage point below eye level or even below if placed on a glass tabletop. Of course, painting from life may not be possible from such an unorthodox angle, so good quality photos might be necessary. Try placing objects containing contrasting elements or those in unusual contexts within the composition. A rusty old engine or an animal skull within a setting of fruit could make the viewer see the objects in a new light. Provide contrast in other ways, such as warm colours against cool; rough and smooth, sunlit and shaded. Provide a quirky focal point by placing just one bright-coloured object within a setting of subdued ones, or one point of sunlight within a shaded view, which might fall across a carefully-selected object. View any object as possible subject matter for a still life, no matter how kitsch. Trawl Ebay, car boots, second-hand shops or house clearances to find truly unique objects or those of yesteryear. A Micky Mouse clock or Rubik’s cube could provide the ideal focal points to an otherwise ordinary still life. Try out different backgrounds rather than that of one of just one colour. A partly-open curtain; a window revealing a dramatic sky or light filtering through lace could bring the background to the fore. Brick, tiles or embossed wallpaper (or peeling wallpaper) will exhibit interesting textures if obliquely-lit. Make unorthodox use of the shadows. Look out for bizarre and weird shadow shapes that may stretch across the table when the light source is shifted around. Bright sunlight filtering through a neighbouring window will often transform the most somber subject matter and bring out bright colours, contrasts and reflected light. Who said the still life had to be completed indoors? Try placing them on a patio table. Lace or lattice material can be used to create a dazzling soupcon of sunlight and shadow over part of the setting. 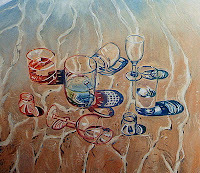 A split view of a still life can be exploited if part of it is distorted by a glass tumbler, a brandy glass or bottles. Try partially filling vessels with clear fluid to optimize this effect. Mirrors and other shiny surfaces will open up the view, otherwise invisible for new compositional possibilities. Unusual patterns over surfaces can be seen if sunlight is filtering through lace curtains or an embroidered lampshade. New possibilities for still life ideas may often become apparent by simply trying things out. Practice is often more illuminating than theory. Mix and match objects; don’t exclude possibilities if they seem farfetched don't write-off objects as too mundane or kitsch. Trawl second hand shops or Ebay.Shift the light source and the viewpoint; juxtapose the still life against different backgrounds. Don’t stop if a good setting is found if it can be made great by a few simple adjustments. Experimentation and exercising visual awareness is often the key to finding original and compelling ideas for painting; still life is no exception. 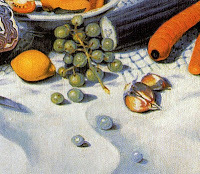 The bright colours of vegetables and fruit in a still life may sometimes appear garish when rendered in paint. 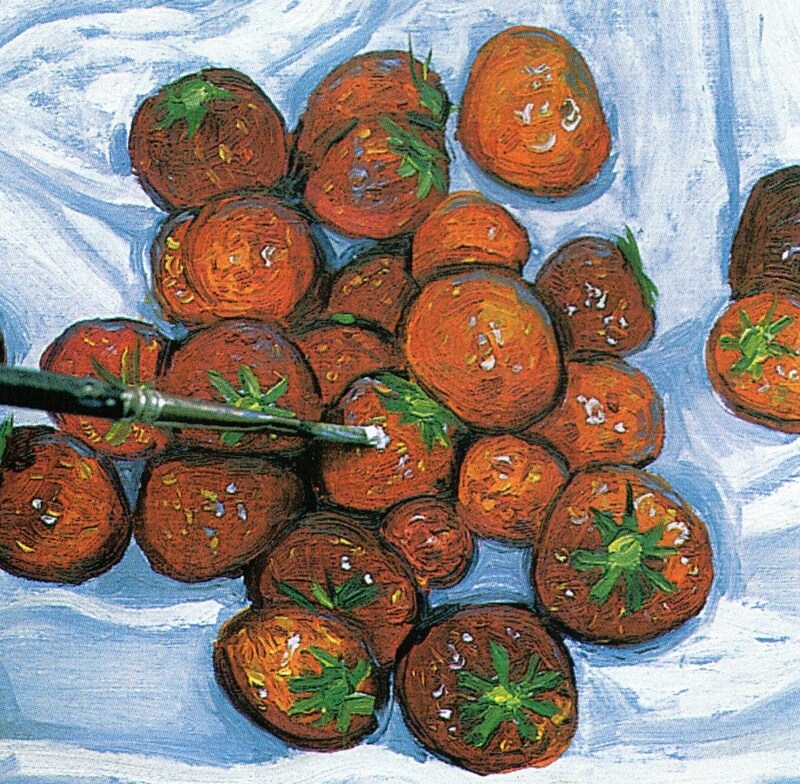 Any red at the artist’s disposal might have been used to portray tomatoes, peppers or pomegranates and then neatly applied in the fashion of colour-by-numbers. Darkening such a bright colour may cause further dissatisfaction when dirty colours result. How can the artist recreate bright-coloured food in still life with deep colours and intense shadows? A poor selection of oil pigments, which do not contain the true primary colours means the colour needed for a still life cannot be mixed. Using any red pigment for red fruit, or any yellow for bananas may result in colour mixes that do not quite hit the mark. Using one pigment for the entire fruit or vegetable concerned may result in flat looking perishables in the still life, that do not appear to inhabit three-dimensional space. Applying bright-coloured oil paint alla prima, or in one layer can sometimes result in colours that lack saturation or depth. The effect can be made worse if applying paint in a thin layer, which will reveal the whiteness of the painting surface beneath. Trying to darken a bright colour with black or dark grey for shadows often results in dingy colours that make the fruit look dirty rather than obliquely-lit. If poorly blended, crescent moon shadows appear to inhabit spheroid food such as apples. Darkening bright colours is a common problem for beginners getting to grips with colour mixing. Rather than use black, dark grey or brown for shadows, use the colour’s opposing colour. In the case of red food such as tomatoes, cherries or strawberries, this will be any colour that lies in the blue spectrum or any colour containing blue. Depending upon the lighting conditions and reflections, this might be violet, Prussian blue, ultramarine, midnight blue, or a “cool” earth colour such as burnt umber. In the case of yellow food, such as bananas and sweet-corn, any color in the violet spectrum would be suitable, which might be indigo, violet or a blend of ultramarine and burnt sienna. Bluish-green foods such as cucumbers and spinach can be darkened with warm reds, oranges or earth colours, which may be cadmium red, vermillion or burnt sienna. Yellowish-green foods such as green grapes and peas require cooler-deeper reds, such as permanent rose or alizarin crimson. In fact, “bright” food can contain a lot of subdued colours, without which the food would not appear so deep. Tomatoes often contain burnt umber, cucumbers, a lot of blue and cherries may contain burnt sienna. Shadows on food will often contain a lot of blues, neutrals and earth colours as well as red or yellow. Exploit the bright colours of food by placing them against a somber or deeply-shadowed background. An obliquely-lit pepper cannot fail to draw the eye when set against dark blue curtains. Bright colours will further draw the eye if not too many are used throughout the painting. Intersperse bright fruit within a dark setting or one that contains subtle colours. Experiment with lighting on bright fruit. Rather than place the light source in front, try the side. Lowering the light source will cause shadows to stretch out across the work surface creating the ideal stage for bright colours. When it comes to effective use of bright colours in a painting, less is often more. Working in glazes is a good way of enriching the colours in a still life with fruit and vegetables. Glazing entails the application of a translucent layer of oil paint over an under-glaze completed alla prima. Placing a thin layer of red oil paint over a preliminary painting of tomatoes for example reinforces the red colour, adds depth or modifies the colour beneath. Remember to keep observing the colour of fruit and vegetables to dispel any inaccurate presumptions. Colour tags for food are best avoided when it comes to mixing the colour of such perishables sensitively. 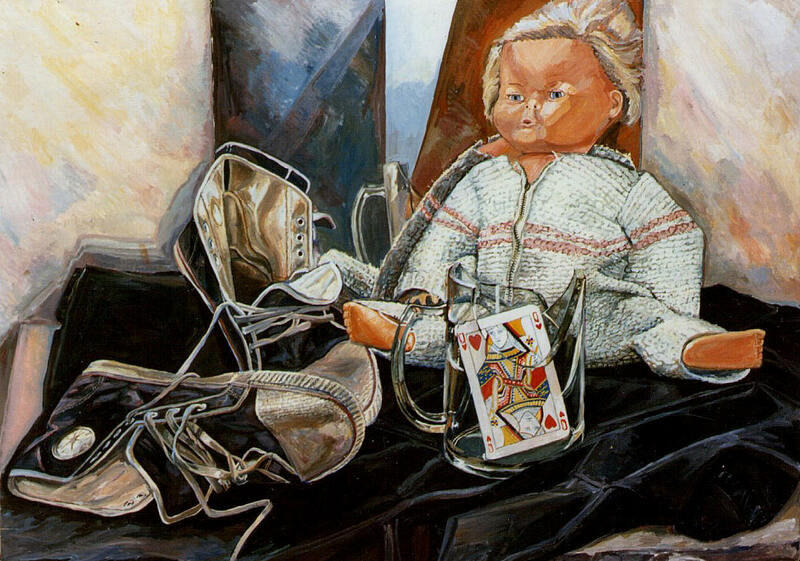 How do I Paint Still Life Objects in Foreshortening? A still life painting containing an object in foreshortened view may appear skewed. Long objects pointing at the viewer such as chair legs, breadsticks, grinders, cutlery, shoelaces clothes pegs or tin openers do not appear to inhabit three-dimensional space as it should. Regardless of how well the other objects have been painted, the skewed object continues to draw the eye, spoiling the effect. How can the artist paint objects foreshortened in as still life convincingly? Giving in to the inner voice that insists that the object is long, regardless of how it appears in foreshortened view, causing the artist to artificially lengthen the object in an attempt to satisfy this inner dogma. Illustrating all sides of the object in an attempt to make it look as though it is projecting from the page as it does so in real life. Granting the object lines which may not be discerned in real life, just to illustrate a long edge or series of edges. Due to the ineffective methods just described, the artist may fiddle with the area until it looks a confused mess. The problem with objects viewed in foreshortening is that the brain becomes split in view. The object is long and yet it appears short in real life. If taking on board both pieces of advice, the dilemma of how to illustrate the foreshortened object cannot be resolved. The following drawing exercise might help with foreshortened objects in still life art. Forget labels for objects and forget any attempt at rendering what the object “is.” The object is no longer an object but a series of abstract contours and tonal shapes. Similarly, forget that it is long or other descriptive labels for how the object “should” look. Watch out for the parallax effect. Viewing the object through one eye and then the other may reveal two completely different views, where an outline may be visible in one view, yet invisible in the other. If the two differ significantly, it might be best to shut one eye whilst attempting to render the foreshortened object. Remember that objects in foreshortened view may not resemble the object viewed in familiar ways. A teapot spout may appear round; a breadknife a triangle; a breadstick as a stub and clothes pegs as squares. Regardless of how impossible the shape may appear, trust what the eye sees and forget what the brain “knows” about the object. A foreshortened object may often not exhibit lines, but areas of light and shadow. Resist the temptation to illustrate lines to demonstrate length if no lines can be seen. Practice drawing simple objects in foreshortened view. If no objects are at hand, simply drawing a pointing finger is a good start. Close one eye to eradicate the parallax view. Imagine the object is not three-dimensional but a flattened jigsaw of lines and tonal shapes. Retain this abstract view during the drawing process forgetting what the object is. Work lightly at first, working steadily darker. Follow the contours faithfully, regardless of how bizarre they might seem. Try other simple objects in isolation such as bottles or beakers. A first attempt may not always yield a satisfactory result, but practice of drawing objects in foreshortened view is a great way of raising visual awareness whilst rendering other objects in a still life. How do I Paint Reflections on Objects in a Still Life? 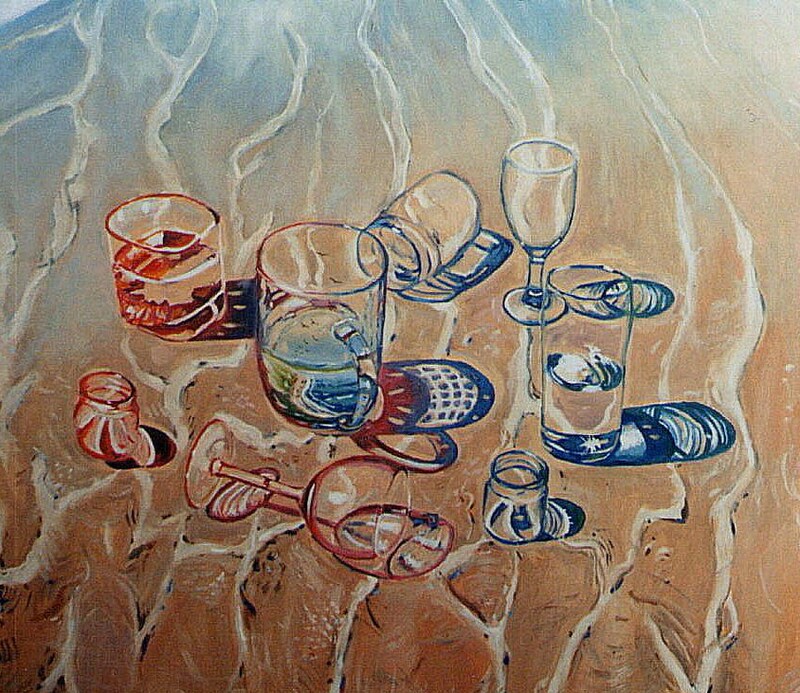 Painting reflections on shiny objects such as silverware, glass or china may bewilder the artist who may not know where to begin. An array of abstract shapes too complex to tackle may cause visual overload that may result or a muddled mess. In other cases, reflections might be rendered as simplified white squares supposed to represent reflections from a window, or single white dots that fails to match up to the true complexity of reflections. How can the artist paint reflections on objects effectively? The task of painting reflections could be made more difficult if trying to paint a still life under complex light conditions which can be found in a multi-windowed room, fluorescent lighting or from reflected light bouncing from other objects. The following practices might also create an unsatisfactory painting of reflections. Assuming that all reflections are white, leading to the exclusive use of titanium and piling it onto the areas concerned. Giving sharp outlines to all the reflections, resulting in the appearance of paper cut-out shapes where the reflections occur. Not varying the hue or tone within the reflection itself, resulting in an over-simplified version of reflections that contains featureless areas that fails to give impact. Painting reflections under shifting lighting conditions may cause the artist to keep altering the painting, particularly if deliberating too much over the area. Painting reflections on a still life can be made a easier by placing the objects under a single light source, such as a room with one window. A few pale flecks might be all that is needed to suggest reflections on smooth surfaces such as china. Reflections come in other forms as well as squares or pinpoints. Careful inspection may reveal an alien jigsaw of abstract shapes of varying hues and tones. White can in fact comprise only a small part of a reflection; violets, blues, greens and earth colours may also be seen. The outlines of reflection can vary from defined edges to no definable edges at all. A reflection will rarely exhibit straight lines, but organic contours, some of which will stretch out. The key is to simplify and to clarify. This means viewing reflections not as a complex maze, but as simplified forms and tonal shapes, forgetting detail until last. Reflections are often paler in tone than the surrounding area and for this reason are hard to judge tonally if painting straight onto a white surface. But painting it last could risk colour contamination from a neighbouring darker colour. To overcome these difficulties, I would try the following steps. With a stiff brush and very thin neat oil paint, roughly sketch in the colour of the object possessing the reflection as though it had no reflection. This entails extending the hue of the object over the reflection area. Ensure the paint is as thin as possible but do not add linseed oil or its fluidness will make working on top difficult. With slightly thicker paint, render the reflections on top. Half close the eyes to simplify the shapes of the highlights into basic tonal areas rather than full detail. Make visual comparisons between the reflection and the surrounding area to ensure it keys in; is the reflection slightly paler, much paler, does it exhibit any hues? Work from dark to pale, using increasingly thicker and paler paint, finishing off with bright highlights which might be rendered with neat white. Retain objectivity by standing back from the painting. Ensure the shapes of the highlights are accurately depicted. Avoid fussing over the area too much or it will lose its freshness. If the painting does not work out, blot off surplus paint and allow to dry over a few days. Work over the area again, aiming for increased accuracy. Once the area has been roughed in, the artist may sharpen up detail by applying increasingly opaque upper glazes. This will give reflections more impact when finishing off with highlights such as those found on shiny ornaments or glassware. Look out for areas where the reflection merges with the local colour of the object such as those found on spheroids. Blending areas with a soft sable will ensure no tonal divisions remain. Working in smooth glazes also provides the ideal foundation onto which reflections can be painted. To achieve definition and an extra smooth finish, add a little linseed oil with the paint. This will help the paint flow. Look out for the colour temperature of highlights, for many are not merely white. Some are warmer than others. Cream highlights, for instance can often be seen on brassware and coins; arctic-blue highlights, on silverware and glass. Bright colours can also be seen in reflections, for instance, if dazzling flowers are placed next to a wine glass. Often the colour reflected will appear more subdued. The secret is to make constant comparisons between the reflection itself, the object onto which it appears and the surrounding area. This will ensure the reflection looks like it belongs to the object, and not as weird cut-out shapes that have been stuck onto the object.